Cruise the waters of the Mississippi River with a variety of cruises that provide dinner and sightseeing for a full evening of entertainment in Memphis. Couples can enjoy the quiet privacy provided with a short moonlit stroll on the decks while families enjoy an informational sightseeing cruise. Different options provide more of a choice for those looking for a specific dining experience on the water. Browse the current dinner cruise options and see if any of them spark your interest. Climb aboard one of the Memphis Riverboats for a leisure cruise down the Mississippi River according to your specifications! This guided cruise provides travelers with a historical overview of Memphis as well as the heroic story of Tom Lee. Hear about the Civil War Battles that were fought on the shores. Pass under some of the oldest bridges in Memphis and hear about their beginnings. While you bask in the history of it all, complete your experience with the timeless views from the deck. 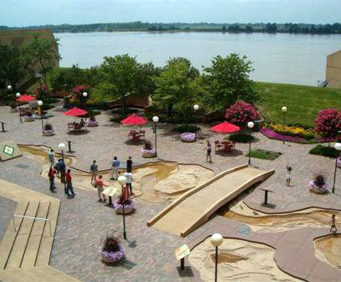 Memphis bluffs, cityscapes, Memphis Pyramid, Mud Island Park and more! A sightseeing cruise is both informational and relaxing for a day spent in leisure. Float down the Mississippi River while you dine with live music and a delicious meal in a luxurious atmosphere that only the Memphis Riverboats can provide. Your southern meal comes complete with grilled chicken and pulled pork, different side dishes, and a delectable dessert. A cash bar is located on board so you can take your drink, stroll the decks, and see the sights of Memphis bathed in moonlight to make a truly romantic experience.